The kidneys are the waste filtering and disposal system of the body. As much as 1/3 of all blood leaving the heart passes into the kidneys to be filtered before flowing to the rest of the body’s tissues. While a person could live with only one functioning kidney, our kidneys are vital organs; the loss of both kidneys would lead to a rapid accumulation of wastes and death within a few days time. The kidneys are a pair of organs found along the posterior muscular wall of the abdominal cavity. The left kidney is located slightly more superior than the right kidney due to the larger size of the liver on the right side of the body. Unlike the other abdominal organs, the kidneys lie behind the peritoneum that lines the abdominal cavity and are thus considered to be retroperitoneal organs. The ribs and muscles of the back protect the kidneys from external damage. Adipose tissue known as perirenal fat surrounds the kidneys and acts as protective padding. The kidneys are bean-shaped with the convex side of each organ located laterally and the concave side medial. 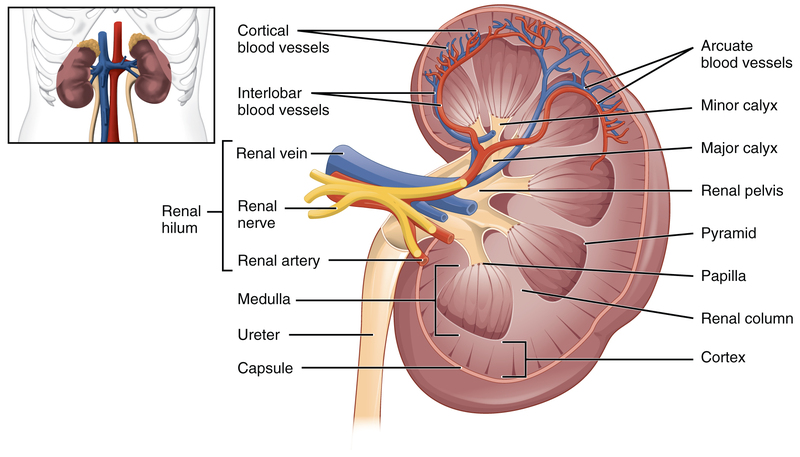 The indentation on the concave side of the kidney, known as the renal hilus, provides a space for the renal artery, renal vein, and ureter to enter the kidney. A thin layer of fibrous connective tissue forms the renal capsule surrounding each kidney. The renal capsule provides a stiff outer shell to maintain the shape of the soft inner tissues. Deep to the renal capsule is the soft, dense, vascular renal cortex. Seven cone-shaped renal pyramids form the renal medulla deep to the renal cortex. The renal pyramids are aligned with their bases facing outward toward the renal cortex and their apexes point inward toward the center of the kidney. Each apex connects to a minor calyx, a small hollow tube that collects urine. The minor calyces merge to form 3 larger major calyces, which further merge to form the hollow renal pelvis at the center of the kidney. The renal pelvis exits the kidney at the renal hilus, where urine drains into the ureter. 1. The renal arteries branch directly from the abdominal aorta and enter the kidneys through the renal hilus. 2. Inside our kidneys, the renal arteries diverge into the smaller afferent arterioles of the kidneys. 3. Each afferent arteriole carries blood into the renal cortex, where it separates into a bundle of capillaries known as a glomerulus. 4. From the glomerulus, the blood recollects into smaller efferent arterioles that descend into the renal medulla. 5. The efferent arterioles separate into the peritubular capillaries that surround the renal tubules. 6. Next, the peritubular capillaries merge to form veins that merge again to form the large renal vein. 7. Finally, the renal vein exits the kidney and joins with the inferior vena cava, which carries blood back to the heart. Each kidney contains around 1 million individual nephrons, the kidneys’ microscopic functional units that filter blood to produce urine. The nephron is made of 2 main parts: the renal corpuscle and the renal tubule. Responsible for filtering the blood, our renal corpuscle is formed by the capillaries of the glomerulus and the glomerular capsule (also known as Bowman’s capsule). The glomerulus is a bundled network of capillaries that increases the surface area of blood in contact the blood vessel walls. Surrounding the glomerulus is the glomerular capsule, a cup-shaped double layer of simple squamous epithelium with a hollow space between the layers. Special epithelial cells known as podocytes form the layer of the glomerular capsule surrounding the capillaries of the glomerulus. Podocytes work with the endothelium of the capillaries to form a thin filter to separate urine from blood passing through the glomerulus. The outer layer of the glomerular capsule holds the urine separated from the blood within the capsule. At the far end of the glomerular capsule, opposite the glomerulus, is the mouth of the renal tubule. A series of tubes called the renal tubule concentrate urine and recover non-waste solutes from the urine. The renal tubule carries urine from the glomerular capsule to the renal pelvis. 1. The curvy first section of the renal tubule is known as the proximal convoluted tubule. The tubule cells that line the proximal convoluted tubule reabsorb much of the water and nutrients initially filtered into the urine. 2. Urine next passes through the loop of Henle, a long straight tubule that carries urine into the renal medulla before making a hairpin turn and returning to the renal cortex. 3. Following the loop of Henle is the distal convoluted tubule. 4. Finally, urine from the distal convoluted tubules of several nephrons enters the collecting duct, which carries the concentrated urine through the renal medulla and into the renal pelvis. 5. From the renal pelvis urine from many collecting ducts combines and flows out of the kidneys and into the ureters. The primary function of the kidneys is the excretion of waste products resulting from protein metabolism and muscle contraction. The liver metabolizes dietary proteins to produce energy and produces toxic ammonia as a waste product. The liver is able to convert most of this ammonia into uric acid and urea, which are less toxic to the body. Meanwhile, the muscles of our body use creatine as an energy source and, in the process, produce the waste product creatinine. Ammonia, uric acid, urea, and creatinine all accumulate in the body over time and need to be removed from circulation to maintain homeostasis. The glomerulus in the kidneys filter all four of these waste products out of the bloodstream, allowing us to excrete them out of our bodies in urine. Around 50% of the urea found in the blood is reabsorbed by the tubule cells of the nephron and returned to the blood supply. Urea in the blood helps to concentrate other more toxic waste products in urine by maintaining the osmotic balance between urine and blood in the renal medulla. 1. The kidneys filter blood as it passes through the capillaries that form the glomerulus. Blood pressure forces most of the blood plasma through the lining of the capillaries and into the glomerular capsule. Blood cells are too large to pass through the capillary lining and so remain within the capillaries along with some residual plasma. The filtered plasma, now known as tubular fluid, begins to flow out of the glomerular capsule and into the proximal convoluted tubule. 2. At the same time, the concentrated blood that remains inside the capillaries of the glomerulus moves into the efferent arterioles and on to the peritubular capillaries surrounding the proximal convoluted tubule. Epithelial cells lining the tubule actively reabsorb valuable molecules of glucose, amino acids, and ions from the filtrate and deposit them back into the blood. These cells also absorb any waste products remaining in the blood (such as ammonia and creatinine) and secrete these chemicals into the filtrate. While these solutes are being exchanged, osmotic pressure pushes water from the dilute, hypotonic filtrate back into the concentrated, hypertonic blood. 3. From the proximal convoluted tubule, the tubular fluid next enters the loop of Henle, where water and ions are reabsorbed. The descending limb of the loop of Henle is permeable to water and carries the filtrate deep into the medulla of the kidney. Tissues in the medulla surrounding the tubule contain a high concentration of ions and very little water compared to the filtrate. Osmotic pressure between the hypotonic filtrate and hypertonic medullary cells pushes water out of the filtrate and into the cells. The cells of the medulla return this water to the blood flowing through nearby capillaries. 4. Filtrate next passes through the ascending limb of the loop of Henle as it exits the medulla. The tissues surrounding the ascending limb are not permeable to water but are permeable to ions. The filtrate is very concentrated after passing through the descending limb, so ions easily diffuse out of the filtrate and into the cells lining the ascending limb. These ions are returned to the blood flowing through nearby capillaries. 5. Tubular fluid exiting the loop of Henle next passes through the distal convoluted tubule and the collecting duct of the nephron. These tubules continue to reabsorb small amounts of water and ions that are still left in the filtrate. The tissues surrounding the collecting duct actively absorb excess potassium and hydrogen ions from the nearby capillaries and secrete these excess ions as waste into the filtrate. 6. When filtrate reaches the end of the collecting duct, almost all of the valuable nutrients, ions, and water have been returned to the blood supply while waste products and a small amount of water are left to form urine. The urine exits the collecting duct and joins with urine from other collecting ducts in the renal pelvis. The kidneys are able to control the volume of water in the body by changing the reabsorption of water by the tubules of the nephron. Under normal conditions, the tubule cells of the nephron tubules reabsorb (via osmosis) nearly all of the water that is filtered into urine by the glomerulus. Water reabsorption leads to very concentrated urine and the conservation of water in the body. The hormones antidiuretic hormone (ADH) and aldosterone both increase the reabsorption of water until almost 100% of the water filtered by the nephron is returned to the blood. ADH stimulates the formation of water channel proteins in the collecting ducts of the nephrons that permit water to pass from urine into the tubule cells and on to the blood. Aldosterone functions by increasing the reabsorption of Na+ and Cl- ions, causing more water to move into the blood via osmosis. In situations where there is too much water present in the blood, our heart secretes the hormone atrial natriuretic peptide (ANP) in order to increase the excretion of Na+ and Cl- ions. Increased concentration of Na+ and Cl- in urine draws water into the urine via osmosis, increasing the volume of urine produced. The kidneys regulate the pH level of the blood by controlling the excretion of hydrogen ions (H+) and bicarbonate ions (HCO3-). Hydrogen ions accumulate when proteins are metabolized in the liver and when carbon dioxide in the blood reacts with water to form carbonic acid (H2CO3). Carbonic acid is a weak acid that partially dissociates in water to form hydrogen ions and bicarbonate ions. Both ions are filtered out of the blood in the glomerulus of the kidney, but the tubule cells lining the nephron selectively reabsorb bicarbonate ions while leaving hydrogen ions as a waste product in urine. The tubule cells may also actively secrete additional hydrogen ions into the urine when the blood becomes extremely acidic. The reabsorbed bicarbonate ions enter the bloodstream where they can neutralize hydrogen ions by forming new molecules of carbonic acid. Carbonic acid passing through the capillaries of the lungs dissociates into carbon dioxide and water, allowing us to exhale the carbon dioxide. The kidneys maintain the homeostasis of important electrolytes by controlling their excretion into urine. - Sodium (Na+): Sodium is a vital electrolyte for muscle function, neuron function, blood pressure regulation, and blood volume regulation. Over 99% of the sodium ions passing through the kidneys are reabsorbed into the blood from tubular filtrate. Most of the reabsorption of sodium takes place in the proximal convoluted tubule and ascending loop of Henle. - Potassium (K+): Just like sodium, potassium is a vital electrolyte for muscle function, neuron function, and blood volume regulation. Unlike sodium, however, only about 60 to 80% of the potassium ions passing through the kidneys are reabsorbed. Most of the reabsorption of potassium occurs in the proximal convoluted tubule and ascending loop of Henle. - Chloride (Cl-): Chloride is the most important anion (negatively charged ion) in the body. Chloride is vital to the regulation of factors such as pH and cellular fluid balance and helps to establish the electrical potential of neurons and muscle cells. The proximal convoluted tubule and ascending loop of Henle reabsorb about 90% of the chloride ions filtered by the kidneys. - Calcium (Ca2+): Calcium is not only one of the most important minerals in the body that composes the bones and teeth, but is also a vital electrolyte. Functioning as an electrolyte, calcium is essential for the contraction of muscle tissue, the release of neurotransmitters by neurons, and the stimulation of cardiac muscle tissue in the heart. The proximal convoluted tubule and the ascending loop of Henle reabsorb most of the calcium in tubular filtrate into the blood. Parathyroid hormone increases the reabsorption of calcium in the kidneys when blood calcium levels become too low. - Magnesium (Mg2+): Magnesium ion is an essential electrolyte for the proper function of enzymes that work with phosphate compounds like ATP, DNA, and RNA. The proximal convoluted tubule and loop of Henle reabsorb most of the magnesium that passes through the kidney. The kidneys help to control blood pressure in the body by regulating the excretion of sodium ions and water and by producing the enzyme renin. Because blood is mostly made of water, an increased volume of water in the body results in an increase in the volume of blood in the blood vessels. Increased blood volume means that the heart has to pump harder than usual to push blood into vessels that are crowded with excess blood. Thus, increased blood volume leads to increased blood pressure. On the other hand, when the body is dehydrated, the volume of blood and blood pressure decrease. The kidneys are able to control blood pressure by either reabsorbing water to maintain blood pressure or by allowing more water than usual to be excreted into urine and thus reduce blood volume and pressure. Sodium ions in the body help to manage the body’s osmotic pressure by drawing water towards areas of high sodium concentration. To lower blood pressure, the kidneys can excrete extra sodium ions that draw water out of the body with them. Conversely, the kidneys may reabsorb additional sodium ions to help retain water in the body. Finally, the kidneys produce the enzyme renin to prevent the body’s blood pressure from becoming too low. The kidneys rely on a certain amount of blood pressure to force blood plasma through the capillaries in the glomerulus. If blood pressure becomes too low, cells of the kidneys release renin into the blood. Renin starts a complex process that results in the release of the hormone aldosterone by the adrenal glands. Aldosterone stimulates the cells of the kidney to increase their reabsorption of sodium and water to maintain blood volume and pressure. The kidneys maintain a small but important endocrine function by producing the hormones calcitriol and erythropoietin. - Calcitriol is the active form of vitamin D in the body. Tubule cells of the proximal convoluted tubule produce calcitriol from inactive vitamin D molecules. At that point, calcitriol travels from the kidneys through the bloodstream to the intestines, where it increases the absorption of calcium from food in the intestinal lumen. - Erythropoietin (EPO) is a hormone produced by cells of the peritubular capillaries in response to hypoxia (a low level of oxygen in the blood). EPO stimulates the cells of red bone marrow to increase their output of red blood cells. Oxygen levels in the blood increase as more red blood cells mature and enter the bloodstream. Once oxygen levels return to normal, the cells of the peritubular capillaries stop producing EPO. Several hormones produced elsewhere in the body help to control the function of the kidneys. - Antidiuretic hormone (ADH), also known as vasopressin, is a hormone produced by neurosecretory cells in the brain’s hypothalamus. These cells extend into the posterior pituitary, which stores and releases ADH. ADH production is stimulated by a decrease in blood volume and increased blood osmolarity. ADH helps the body retain water by increasing the number of water channels in the cells of the collecting ducts of the kidneys. These water channels allow water remaining in urine to be reabsorbed into the blood, resulting in extremely concentrated urine. - Angiotensin II is a hormone made in the liver and activated by the enzymes renin and angiotensin-converting enzyme. Once activated, angiotensin II increases the reabsorption of sodium and chloride ions in the proximal convoluted tubule, leading to an increased reabsorption of water as well. - Aldosterone is a hormone produced in the adrenal cortex in response to Angiotensin II. Aldosterone binds to target cells in the walls of the nephron’s collecting ducts. These cells reabsorb additional sodium and chloride ions that would have been excreted as urine. The target cells also remove potassium ions from the blood and excrete it into urine. - Atrial natriuretic peptide (ANP) is a hormone produced by cardiac muscle cells in the atria of the heart. These cells produce ANP in response to high levels of sodium in the blood or increased blood pressure. In the kidneys, ANP increases the glomerular filtration rate so that more blood plasma is forced into the glomerular capsule and into the renal tubules. ANP also removes some solutes from the cells of the renal medulla, making the loop of Henle less efficient in reabsorbing water and ions from the filtrate. The net result of ANP is that more sodium and water end up being excreted into urine, blood volume decreases, and blood pressure decreases as well.